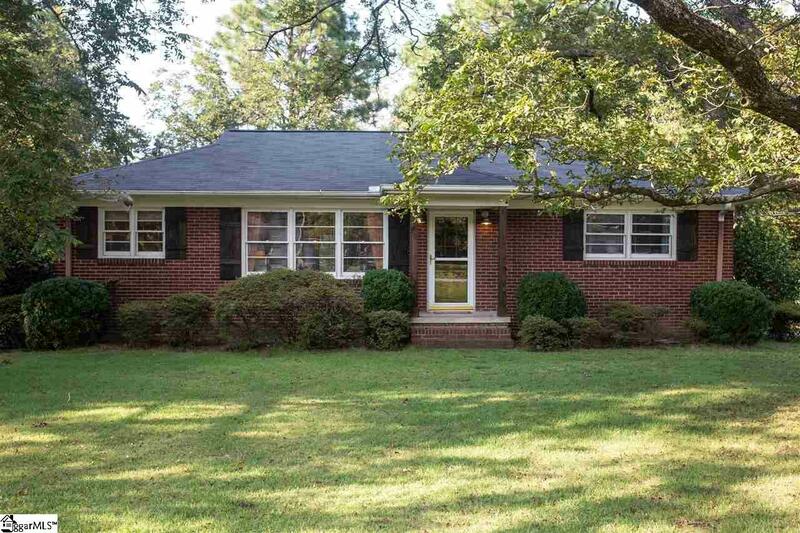 The renovated brick ranch you&apos;ve been searching for is here! Located in the heart of Greenville, easy access to every part of town and neighboring towns! Only 3 miles from downtown Greenville! This home has been maintained exceptionally with very tasteful and current renovations throughout. The lot is nearly 1 acre, with the back portion fenced in! This is not your ordinary 2 bedroom as it has plenty of space to spread out with a study, sunroom/greenhouse, and a basement! Over 1400 square feet. Renovations include: Full bath fully gutted and added tile, shiplap, granite counters, lighting, paint; removed walls to create open floor plan; added accent walls; new baseboard trim; replaced some interior and exterior doors;new interior light fixtures; new wall coverings and paint; new tile in kitchen and breakfast room; updated electrical system; refinished existing hardwood floors; new wood columns on front porch; new wooden shutters; updated stairs to basement; made the study a functional room. This home has all the charm and durability of a 1950&apos;s home with touches of modern, custom design and functionality! Book your showing today!